Team Book Blogger: It’s the last day of Book Blogger Appreciation Week 2012, an event created by Amy Riley of myfriendamysblog.com. Participants responded to a series of questions about book blogging and were given the opportunity to network with their peers and recommend some favorite blogs and books. While it’s too late to get involved this year, you can read about what others said here. Call Me Maybe: Or just take a book. 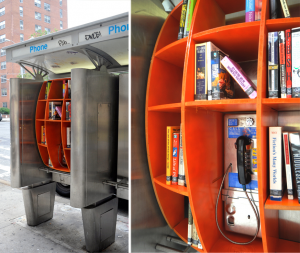 John H. Locke, a Manhattan-based architectural designer has been putting bookshelves in public telephone booths around the Upper West Side and stocking them with books free for the taking. 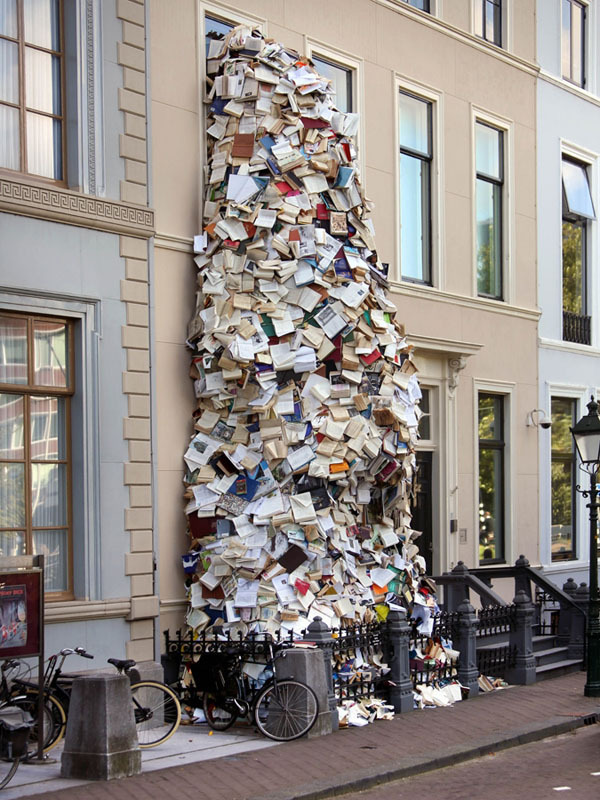 While neither the books nor the shelves last for long, I think it's a clever and wonderful project. Read more in the New York Times article about the project. I got so excited about it I went to one of the locations the day after the article appeared. Unfortunately, there was nothing left of the library. But this doesn't seem to discourage Mr. Locke. I'll be on the lookout for more of his work. One of Mr. Locke's phone booth libraries. Saturday, September 15; 6 p.m. Free! Saturday Night Fever kicks off in the East Village at 6 p.m. The mayhem that follows includes 3 hours, 23 venues, and 100+ authors in literary readings, conversations, games, music, burlesque, and more. On the roster of fabulous acts are Irvine Welsh (Trainspotting) and America’s sweetheart Molly Ringwald (discuss her new novel, When it Happens to You).An after party for the ages follows.It’ll be a night to remember—so be sure not to miss it. See what else is in store with our full schedule. Listeners enjoying a glass of wine at a reading. 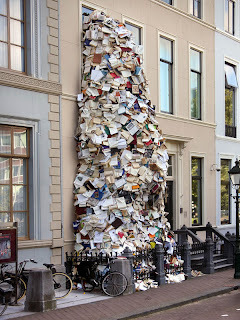 Falling Books: Book art by Alicia Martin; on display as part of the International Paper Biennale 2012 in the Netherlands. You can see more of Ms. Martin's work here. John Locke's project is similar to Little Free Libraries. Great ideas.